Does teaching your preschooler to read feel like a pretty tall order? Maybe it’s something that other moms can do – but you’re afraid to try. What if you mess it up? Or maybe you have tried — only to feel frustrated by your lack of progress. Let’s try one more… you think preschoolers are too young to learn to read. What’s the rush? We need to let them be kids. Today I’m sharing an age-appropriate, hands-on curriculum designed for parents. You can teach your preschooler to read – and let him be a kid, too! When I first started blogging, one of the first sites that caught my eye was This Reading Mama. I was blown away by her preschool reading curriculum! She clearly knew what she was talking about. And no wonder – Becky earned her M.Ed. in Elementary Reading and was a private reading tutor until she began homeschooling her four kids. Now I’m using her Reading the Alphabet curriculum with my two preschoolers. One is almost five, the other just over three. I love adjusting this flexible curriculum to meet the needs of both my boys! 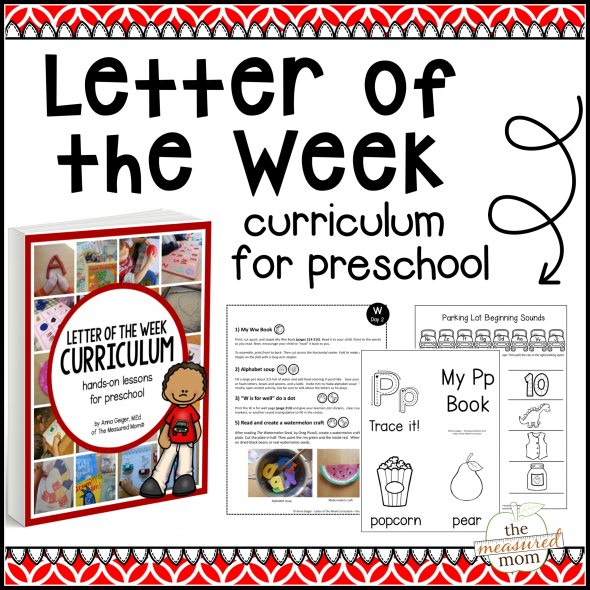 The curriculum is designed for preschoolers who know their letters and sounds and are ready for the next step – but not quite a fast-paced kindergarten curriculum. You’ll find loads of hands-on learning ideas – just right for young learners. 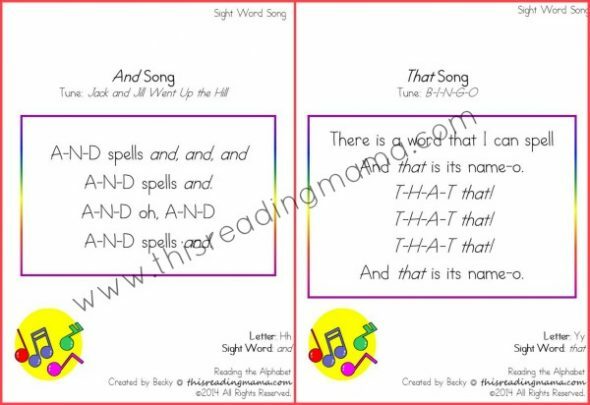 It’s educationally sound – it includes just what preschoolers need to learn to read. Curricula can be very intimidating. Not Reading the Alphabet! It’s divided into 31 weekly lessons. Each lesson contains a suggested 5-day plan for learning. Not sure what to do with the pocket chart, letter book, or initial sound sort? Don’t worry. Becky explains each piece of the curriculum at the beginning of the download. Similar ideas are repeated each week, so you’ll get the hang of it in no time. If you’re more of a visual person, just visit This Reading Mama’s website. She shares each lesson with pictures and explanations along the way. If you find a reading curriculum that demands that you do every activity in order… that’s a big warning sign. Are the lessons scripted? Run the other way! What those curriculum developers don’t understand is that every child is different. Parents and classroom teachers know their children best. In Reading the Alphabet, Becky encourages you to pick and choose the activities that interest and meet the needs of your child. Reading the Alphabet is the framework I use for teaching my boys to read — but because my older son has been recognizing words and starting to sound them out for quite some time, I move at an accelerated pace. My three-year-old still needs some alphabet reinforcement, so I just do the simpler activities with him. They’re both learning and growing – at just the right pace for each of them. Its printables aren’t merely worksheets — they’re interactive learning tools. 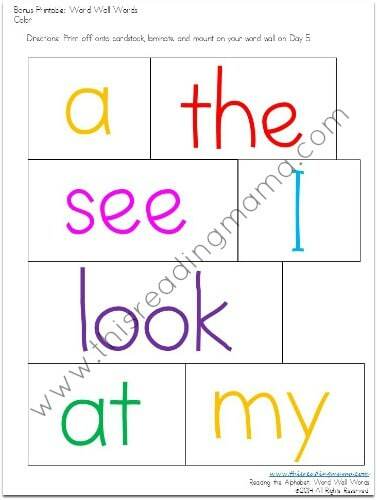 The words from each emergent reader are also used in pocket chart sentences. This is our favorite part of the curriculum! My boys love reading with their pointers. The pictures are the clue for the last word. 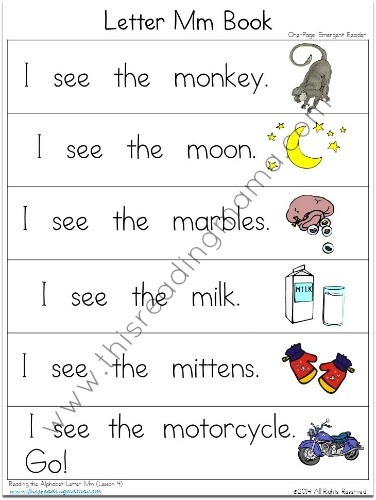 The repeated exposure to sight words help them stick. Here’s another use for those pictures: after you’ve gone through a few lessons, sort them by beginning sound. This was a challenge for my Three, but he’s getting it! My Three already does great at rhyming – but he got even more practice by gluing down the rhyming pictures with this printable. You can use this math printable in many different ways. Since my Three is still mastering number recognition, I called out the numbers and had him cover them with our power magnets. I love these printables for learning print awareness. I scrambled the words. After my Four drew a picture, I told him what the sentence should say. He found each word and assembled them in order. Then he could read it himself! Reading the Alphabet focuses on one word family for each short vowel. This bottle cap spelling is great for beginning readers. Since my Four was ready to forge ahead, I copied Becky (with her permission!) and made milk and bottle cap spelling mats for all the short a word families (see them here!). Even though I taught first grade for a number of years, I was a little unsure when starting from scratch with my own kids. So when I found the logical sequence of sight word and alphabet learning in Reading the Alphabet, I was hooked. It’s done great things for my kids! My Four has gained confidence in reading emergent readers. He has learned voice-to-print matching, is building his sight word vocabulary, and is gaining automaticity when reading three-letter-words in word families. My Three knows almost all his letters and most of their sounds, has learned a few basic sight words, and is able to read a very basic emergent reader (and boy is he proud!). With time and practice, I know that both of my boys will continue to grow in their reading ability. I can’t wait to see where they go! You can use this curriculum for free – visit This Reading Mama and download each lesson and printable one by one. That’s what I’ve been doing for a few months. But now that Becky has packaged the entire curriculum, I have it all on my computer in just six downloads. I have quick and easy access to the materials whenever I want them! These are just a few of the “extras” you’ll get with the paid version. And it’s just $12. Yup! Twelve dollars for 31 weeks of lessons – 1300+ pages of material – in just six easy downloads. 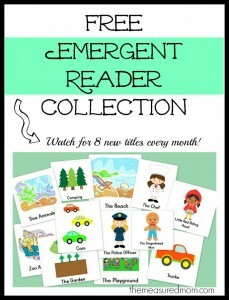 And check out my set of free emergent readers that I’ve created to use alongside Reading the Alphabet! How do you incorporate the word families with the Reading the Alphabet curriculum? Is there a certain order you introduce the word families, or do you wait until you have learned all the site words? I am feeling overwhelmed with all the emergent reader options and not knowing how many I can expect my four year old to be focused on a week! He already knows all the letters and sounds. Any advice would be appreciated! I must also say thank you for sharing your ideas for free! It is so great to have these resources and not have to pay for them! Thanks for sharing your time and talents!